1. How long has Top Guard been around? 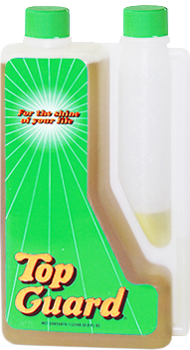 TOP GUARD® is a patented product whose origin was in the cosmetic / pharmaceutical industry. There were no preconceived ideas during its development as to how it should work or what it should look like. As a result, a product evolved and was put to use by the largest cleaning contractor in the world at a local university. They used this product called TOP GUARD® on resilient tile, terazzo, and marble floors. During five years of testing, not one floor under TOP GUARD'S® care ever needed stripping. Pad usage was down, floor finish and spray buffing were virtually eliminated and labor savings kept piling up! Another regional contractor also helped in the development of TOP GUARD® and as a result increased their sales, from three to ten million dollars. 2. How is Top Guard Used? Top Guard is packaged in one liter self-dispensing bottles which accurately measure the different dilutions that are recommended. 2 oz. to each gallon for damp mopping as a preburnish; 1/4 oz. to each gallon for use in an automatic scrubber as an all purpose cleaner, or for damp mopping; 3 oz. to each gallon as a spray buff; 4 oz. to each gallon for heavy duty scrubbing with an automatic scrubber or slow speed floor machine. Top Guard is also a wonderful carpet spotter and shampoo, spray and wipe, deodorant for bathrooms and probably the best car wash we've ever seen. 3. How many square feet will the one liter bottle cover? The liter makes enough pre-burnish for 51,000 square feet or it will dilute down to make 135 gallons of ready to use mopping detergent. 4. Can Top Guard be used on a bare floor? Yes, it's a very effective cleaner and when buffed it leaves a slight sheen. 5. To achieve a gloss, do I need some coating on the floor before I use Top Guard? Yes, Top Guard is a floor finish enhancement agent. 6. Can I use it with my present floor finish? Yes, Top Guard works great on anyone's finish and will make your own favorite last much longer. 7. How safe is it? Top Guard in its first 2 1/2 years of commercial marketing produced enough to burnish 6.7 billion square feet without a single recorded incident of any slip of fall aaand... Top Guard is non-toxic, D.O.T. listed non-hazardous, can be UPS'd, FED EX'd, air freighted without any warnings or cautions. But like liquid hand soap, Top Guard will irritate the eyes. 8. When I use Top Guard, do I eliminate any cleaning steps? Yes. You eliminate spray buffng, dust mopping, stripping, and almost half of your current frequencies of scrubbing and burnishings because the floor holds up so much longer. Re-coating will be substancially reduced too. In fact, if you'll dilute Top Guard at 3 ounces to the gallon, you can burnish whilr it's still wet to restore a floor without stripping. You won't have to rinse or dust mop and you'll get a great shine. 9. How often do I need to use Top Guard? Whenever you normally burnish, clean or scrub your floor. After the third or fourth use of Top Guard, the floor will be smoother and will be much more durable, resisting scuffs, scratches and black heel marks like never before. Begin to reduce frequencies at this time to enjoy some of the labor savings we promise. 10. How much does it cost to use Top Guard? 11. Do I need to damp mop prior to using Top Guard? Yes and no... When using Top Guard as a pre-burnish, not if you use the Two Bucket System. However, for larger areas, the use of an automatic scrubber for pre-cleaning is advised (if pre-cleaning is skipped, any dirt left on the floor will not become "permanent" or burnished in and will be easily removed on the next mopping or scrubbing cycle. Always use Top Guard for cleaning or scrubbing as any other detergent or cleaner will become "burnished in" to the finish resulting in less durability. 12. Can I use any other floor care product with Top Guard? 13. How do I remove Top Guard if I want to? Top Guard is not a coating of any kind and has less than 1/3 of 1% "solids" and does not need removal. This reason alone is why you never experience permanent buildup. 14. Will Top Guard build up on the floor? No. Your floor may become dirty and/or dark in places from unremoved dirt. A soft scrub with an old pad and Top Guard diluted at four ounces to the gallon will restore all the color and remove all the dirt. If enough floor finish is still left on the floor, no need to rinse, just start right in with the usual two ounce burnishing procedure. 15. Will Top Guard make my floor finish more difficult to remove? NO!!! Top Guard fuses the finish and makes it harder and more durable. It does not interfere with the cross linking of the polymer so any good floor stripper will still work well. 16. What speed machine will it work with? Any speed machine, however, the enhanced durability is only achieved with UHS machines of 1500 RPM and higher. 17. What pads work best with Top Guard? 3M aqua and Top line for no dust whatsoever or ETC Lite, Jaguar, Gorilla, 3M Natural Blend White or Tan and any other soft natural hair pad. 18. What type of floor can I use Top Guard on? Any Floor that has a polymer type floor finish on it. 19. Will Top Guard produce dust? 20. When I burnish, will I get swirl marks? Not if Top Guard is used at the proper dilution rate and lightly applied with a damp mop. 21. Are there any reasons why Top Guard might not work as well as you have said? If you over dilute Top Guard when mixing by more than the two ounces to each gallon, you might get scuffng, swirl marks, a smearing look. This will self-correct the next time by using less. If you saturate the floor during the application, having mixed it correctly, you might get scuffng, swirl marks, a smearing look. This too will self-correct the next time by using less. If during the first 2-3 times you use Top Guard you walk too fasst with the burnisher. Top Guard helps to create a great deal of friction and heat which fuses the finish and makes it much more durable. If you walk too fast, you won't generate that heat and while you will get a nice shine, the durability we speak of will not be enhanced as much as we claim. If there is "not enough" finish on the floor. Top Guard is a floor finish enhancement agent and has no "solids" of its own to create a gloss. Top Guard works on your existing finish to make it more durable, shinier, haze free, heel scuff and scratch resistant. If you don't have "enough finish" on the floor, Top Guard can't do its work. If you have used a solvent-based spray buff proir to Top Guard use. These spray buffs inhibit Top Guard's ability to improve gloss. However, durability will be enhanced. Some users have gone to a "soft" scrub of their floors with Top Guard at 3 ounces to a gallon and an old used up pad, which then enables them to achieve the full benefits of Top Guard. 22. Why is Top Guard so hard to find? We've established only a few select demonstrating distributors in each area of the country as Top Guard must be shown (the claims are so hard to believe). Releasing Top Guard to the masses would only result in poor quality sales and disappointed users without proper distributor support. 23. I'm a very large user, can I buy direct? Top Guard does not sell direct. 24. How can I get a free sample and literature? Call us at 1 (800) TOPGUARD. We'll send you literature and the name of the Top Guard company representative in your area. He will arrange for a local distributor to come in and demonstrate Top Guard's benefits to you. 25. What sort of guarantee do you offer? If for any reason, you are unsatisfied, at your expense, simply return the unopened, unused product for a full refund. 26. Anything else I should know? If anyone came to your office and suggested that by using their product, you would save 5% in materials, supplies and labor, you would be "all ears". We're stating from extensive and hundreds af steady users that you'll experience savings of up to 50% in labor and a whopping 70% in materials and supplies. 27. I'm sold. Do I have to do anything special to my floors before trying Top Guard? No, in fact for the test, simply damp mop at the two ounces dilution rate using the two Bucket Method for your first test. Remember to go a lottle slower, to accurately measure, and damp mop very lightly. 28. Any specific cautions once I begin? Yes. As Top Guard is a floor finish enhancer, any of your old build up along the edges will be doubly enhanced and will look exceptionally shiny, perhaps "enhancing" what you don't want enhanced. When the next stripping cycle comes around, use the best stripper you can find and strip like there will be no tomorrow. Get the edges, baseboards and take your time because you'll never have to do this again. 29. Anything else up your sleeve? Yes. We've marketed Basestrip and Baseshield for almost two years on a very limited basis. Basestrip is so strong and so powerful that it will dissolve some of the floor machine wheels and worker's soles (not really but it gives you an idea of how powerful it is). We've put 30 years of experience into it and it's probably the best if not the most expensive floor stripper in the industry at $17.95 per gallon. Baseshield is the hardest and most durable floor finish ever made!!! and an excellent base for Top Guard. It, too, is state of the art price no object and probably too pricey at $24.95 per gallon. Its solids top 27%. Baseshield work very well on all marble, granite, limestone, terrazzo, quarry and stone, as well as every floor finish safe surface. 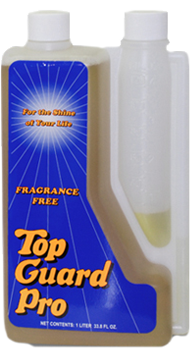 Top Guard Pre-Mixed Spray Buff was just introduced and while you can make your own from the liter bottle, some people wanted us to package a pre-diluted and pre-labeled spray bottle for ease of use. The Moplicator, shown for the first time at the October 97 ISSA Show, this non-electric non-battery machine holds 30 gallons of damp mopping solution and Top Guard pre-burnish. Push it and it will "damp mop," dry and apply Top Guard at a rate of 35,000 square feet per hour. Great for malls, large or small supermarkets, stores and office buildings. It'll go 45,000 square feet without refilling.